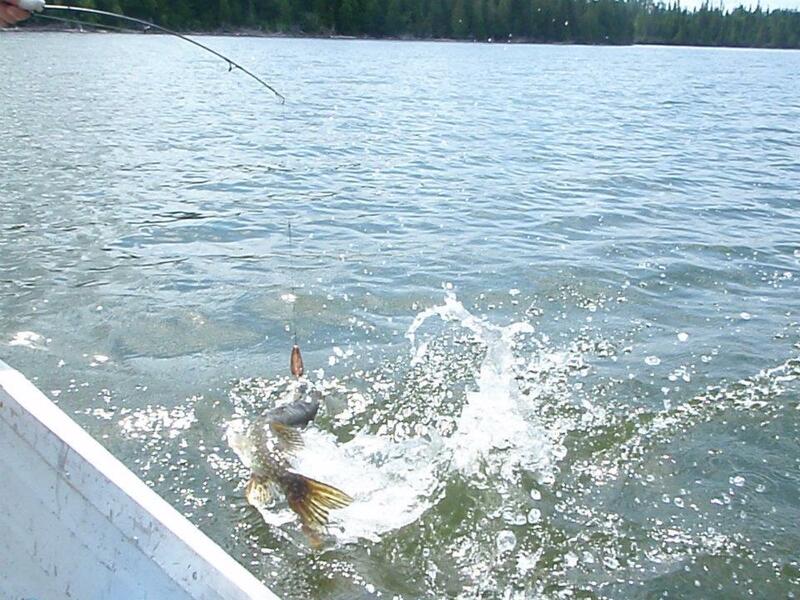 Don't know who is fighting the fish or who will win, but the battle is on! While fishing one of the lakes surrounding Paquette's Camp Shawn caught and released this nice Walleye! Justin is coming in off the lake after a successful day of Walleye fishing. Kari taking the picture helped him with the catching part. Don't know if Kari and Justin are showing off their fish or celebrating with a beer! You would be led to believe that John caught this nice Small Mouth Bass, actually it was his daughter Kari that caught it on Wangoon Lake! 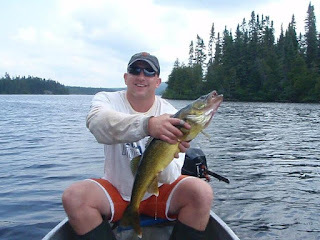 Jeff looks happy with one of the many fish he caught on his first trip to Paquette's Camp! Everyone is enjoying a fish fry at Paquette's Camp, especially Charlie who is smiling for the camera! Mike and Harold come in with the days catch, don't pay any attention to the date on the picture, there has been camera problems this week! Harold, Dave and Charlie are out for a boat ride on Wangoon Lake, looks like everyone is enjoying it! Charlie catches his first fish in Canada, hopefully he will be back for many more! Looks like Tom will eat tonight, not sure about the rest of the group! Harold Summers group went on a trip into the Chapleau Crown Game Preserve. The road is getting a bit narrow, but they know that there is some good fishing at the end of it! Greg has not been to Paquette's Camp for a few years, but it looks like he has not forgot how to fish! Chuck has a fish on, mabyue we will never know what it is. Terry took this picture of a Loon while on a fishing trip to Paquette's Camp a couple of weeks ago! Denny with a nice Northeren Pike, yes it was released and ready for you to have the enjoyment of catching it or a larger one! Looks like a father son competition, so far looks like Dad has is, Vince has a nice fish but Denny has a bigger one, see post below! Denny was nice enough to share this picture of a very nice Small Mouth bass caught on Wangoon Lake and then released.